Get your share of the very beneficial percentages of the Revenue share (REVS), Whitelabel and Lifetime+ programs! Earn up to $300 per each member new to our network. Cookie validity: 30 days non-rewritable, renewable after 30 days. First cookie wins. New signups of all credit packages worth at least 17.99 shall be eligible for the Tiered PPS payouts network-wide. The basis of the commission you receive is the number of successful signups eligible for the Tiered PPS referred in each period. Please note that free signups are not eligible for the Tiered PPS program. 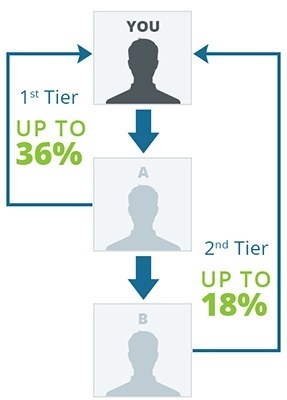 Tiered PPS payouts may not be combined with other promotions and are not eligible for other Bonus payouts. We reserve the right to disqualify any affiliate from the program and may switch affiliate accounts to a revenue share basis in cases of, including but not limited to, low performance, suspected foul play, questionable marketing practices, incentive based signups and generation of traffic through unauthorized sources such as but not limited to social networking sites and online auction sites. In case of fraud (including but not limited to self-signups, incentive based signups and fraudulent signups) affiliate commissions will be withhold or voided and the affiliate account may be terminated. Sales made via email spamming, social networking sites (such as, but not limited to Facebook.com or Myspace.com), member deception by providing false information about the product, or "chat marketing" on instant messenger platforms will not qualify for the PPS payouts. We reserve the right to suspend or terminate pending payments/referrals from the affiliate under this program, whenever the affiliate fails to comply the above referred rules and principles. The rights conferred by this promotion are not transferable and may only be used by the affiliate. However, we reserve the right, at our sole and exclusive discretion, to move, including with retroactive nature, affiliates from this program to another promotional or standard program, adjusting affiliates associated program benefits. If you bring old members who weren't bound to you or other Webmasters before with PPS or Lifetime+ programs, you will earn up to 45% commission after their purchases. This amount increase is permanent and not promotional, we intend to keep this permanent raise of percentage and profit. Sales are tracked by an affiliate cookie (first cookie wins, expires after 14 days and is non-rewritable, but renewable after 14 days). Earn up to 45% commission per each member who is new to our network. Once the member is bound to your account, you keep receiving commissions after their credit purchases, whether or not the purchase was made through your affiliate link. Until the accounts are bound, sales are tracked by an affiliate cookie (first cookie wins, expires after 14 days and is non-rewritable, but renewable after 14 days). Want a stable revenue stream that grows in the long run? Sign up and go REVS! This program is automatically activated on your sales sent through the Video Promotion API Player. With the Video Promotion API you can get up to 35% commission. Currently you can promote only Livejasmin.com with the API. A commission of 35-45% is paid on all your Whitelabel sales, mobile or desktop. Thanks to the same old domain based tracking, all credit purchases are credited on your Whitelabel site (except for those made by members previously referred via PPS). Note that the commission tiers are calculated for each Whitelabel site separately. check them out and sign up! If you are approved for the Referral Program, then your account is automatically entered in the promotion, no need to separately opt-in. A Bonus of up to 50%, as shown on the table on the right, is paid based on the increase of your referral earnings (including both webmaster and cam model referral earnings) compared to the previous two months' average. Other programs such as Whitelabel, RevShare, Lifetime, PPS are not eligible for the Performance Increase Bonus. Click here to start earning for the bonus! The Reference values can be found on the stats page. Please note that the Performance Increase bonus applies ONLY for the Model and Webmaster Referral Program. The Performance Increase Bonus may NOT be combined with other promotions and bonuses (Tiered PPS). Tiered PPS sales are NOT counted in your reference earnings amount. ONLY the referral earnings are counted into your reference earnings amount. Referral commission is paid out after the default commissions. In case of chargebacks, the bonus amount will be deducted from your earnings as well. Introduce new video chat hosts to our sites. Make as much as 36% on the referred cam models' earnings for a year, right from the start. If you are a site owner and have targeted traffic to refer models or if you have a Whitelabel / Co-brand site, you can apply for the model referral program on this link. You will get commissions for the models that you referred after your application has been accepted. Models referred before will not provide a bonus. The bonus is given for the first accounts the model registers using the "Choose myself" option, further accounts will be ineligible for the program. In case of two, three or four person Performer accounts, only one Performer will provide a referral bonus at a time (the one originally referred). We provide all necessary options to make sure the referral is successful, however if the circumstances do not allow the system to recognize the referral connection (e.g. the model registers with another cookie or no cookie in the browser), we are not able to change the referral status later on. Inviting affiliates to AWE is an easy way to increase your profits. Spread the word using the marketing channels available to you. Make as much as 36% on referred webmasters' sales for a year, right from the start. PLUS get up to 18% on all new webmasters' sales they refer. PLUS get up to 18% on all new cam models' earnings they refer.